would be nothing but a memory. However, I think our memories would be the best of the lot in my mind. I learned more from Divye than from the rest of the campus. He's a treasure of uncalculable amount of knowledge. And the best thing is there is no mystery behind why he is the DK. Many people have a superstition that hard work is for someone who has no ability/skill. DK is the first person who shattered such orthodoxy in me by proving how a combination of passion, ability and perseverance can make wonders in your life. Of many, I thank him for this one particularly. Everyone knows the geeky side of DK. They remember him whenever they face with any problem regarding computers. They know he is the go to guy for all tech problems. They feel insecure at the sight of his confidence and knowledge. If only they'd look beyond the beauty of his brain into the beauty of his heart. To anyone who still doubt it, I can assure you that DK is human like you and me :). For me he is the goto guy for any problem. So, a number of people have posted that they don't like the new Unity Desktop interface so much on the new Ubuntu 11.04. You're reading this guide because you probably are having trouble adjusting to it. I, on the other hand, am starting to find Unity quite an improvement over the so called Ubuntu Classic interface. So, to help you out, here are a couple of tips that will push you along on the path of becoming a Unity fanboy. Observation: The main menu bar for all applications has been shifted into the title bar. This is quite similar to the way the Mac handles things. The currently running application's title bar is hidden in the top bar. To show it, you can either move your mouse over to the top bar or you can press the Alt key. I personally prefer the Alt key as it's a keyboard friendly way of accessing the menu. Many people have gripes with the left sidebar present in the Unity interface. The primary problem being that the default softwares on the left menu are not the ones they might be using the most. So, here are a few tips I've used to improve my experience with the sidebar. Tip 1: Open the applications that you use frequently and locate their icons on the left panel. Right click on them and check mark the "Keep in Launcher" menu item. They end up being very readily available. Tip 2: You can open the launcher menu from the keyboard by using the shortcut key Alt+F1. The topmost launcher icon gets highlighted and you can use the keyboard to navigate to the application that you want to switch to or start. If you want to directly start an application, use the Alt+F2 shortcut. (In Ubuntu Class this would bring up the Run box. Now, it brings up a sleeker interface to search for and open folders or applications). Tip 3: The icons present in the launcher menu are rearrangable. Long click on the icons to make the icons draggable and modify the menu to suit your taste. A pro-tip here is that the top 10 menu items are accessible directly from the keyboard. So make sure you put your frequently used icons there. My suggestions are that you should have a Chrome/Firefox, Gedit, Terminal, Totem and Synaptic present in the top 10 icons. Tip 4: As alluded to in Tip 3, the top 10 launcher icons are accessible via keyboard shortcuts. Press the Windows Key (Win key) along with a number to launch the corresponding icon. This will launch the application if it hasn't started or switch to it if an instance of it already exists. This is pretty handy for switching between applications as you don't need to go through the Alt+Tab mechanism and you can directly switch if you remember the launcher number of the application that you want to switch to. 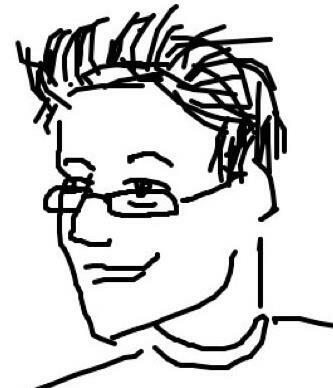 For example, I frequently open a number of windows and when I want to switch over to my web browser (Chrome) whose icon is present at location 2 in my launcher, I just press Win+2. That's it! I'm now in Chrome. Now if I want to go back to my code in Gedit, I just press Win+4 and I'm in Gedit. No messy Alt+Tab business. So that concludes my short introduction to Unity and it's keyboard shortcuts. I hope you liked it. 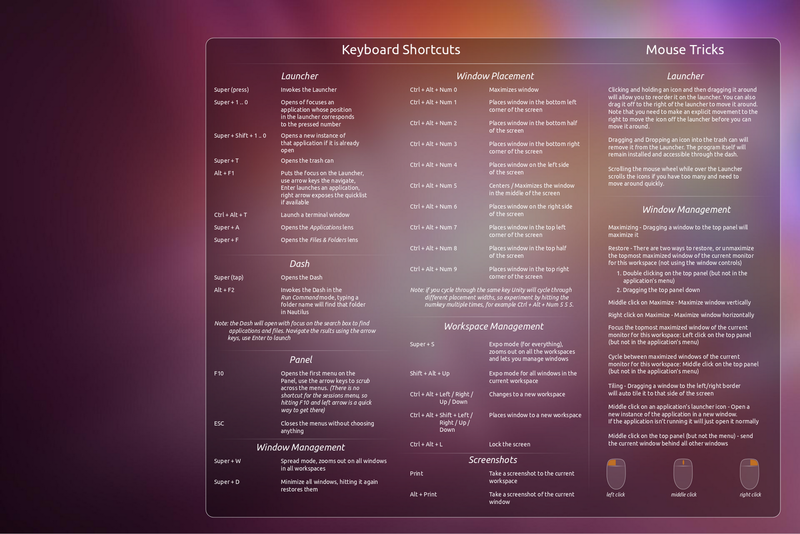 A complete list of the keyboard shortcuts for Unity is in the image below. Feel free to comment if you have any tips of your own.